Great photos of nature ! I am delighted with the beautiful collage. Greetings from distant, storm Polish. Not all mushrooms are edible but they sure are lovely to photograph! I smiled when I saw the mushroom turned up in the shape of a U. I wonder why some mushrooms do that! What an interesting selection - not sure if I've ever seen a pecan tree. 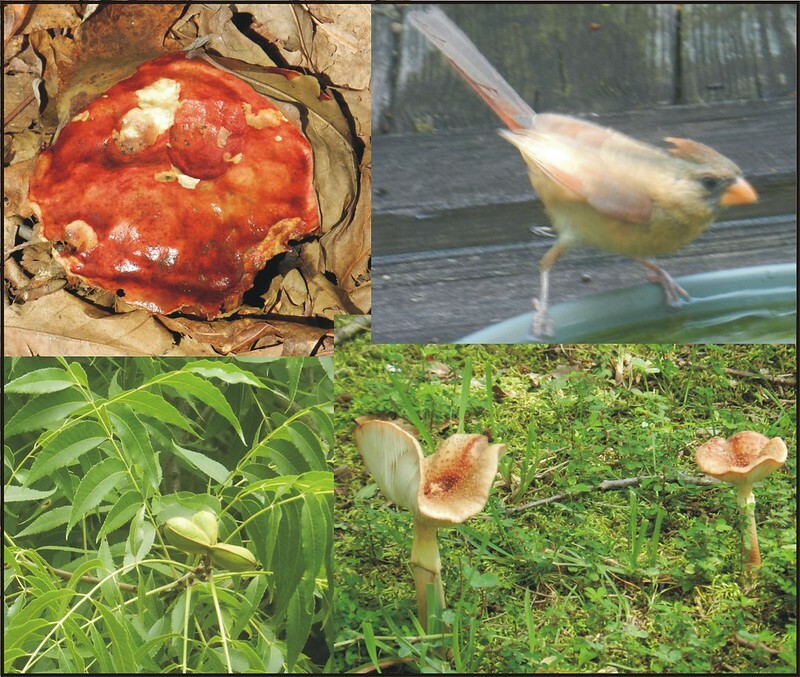 The mushrooms are notable, and the cardinal is a delight. A cool collage, love the fungi! What a nice summer collage. We had never seen pecan trees until we traveled and once in Texas somewhere we stayed in an RV Park right next to a pecan grove... they are pretty trees and prolific. Carver I have just been noticing mushrooms growing in the grass since we had so much rain and cooler weather.